Wordplay and punning involving the names Philemon (Φιλήμων, “affectionate one”) and Onesimus (Ὀνήσιμος, “useful”) and their meanings, with concomitant paronomasia involving the name-title Χριστός (Christos) and various homonymic terms, constitutes a key element in Paul’s polite, diplomatic, and carefully-worded letter to Philemon, the Christian owner of a converted slave named Onesimus. 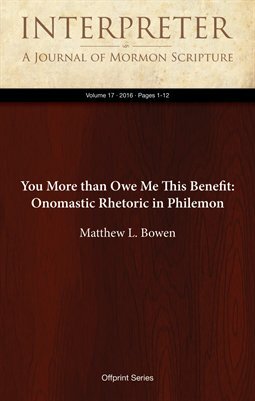 Paul artfully uses Philemon’s own name to play on the latter’s affections and to remind him that despite whatever Onesimus may owe (ὀφείλει, opheilei) Philemon, Philemon more than owes (προσοφείλεις, prosopheileis) his very self — i.e., his life as a Christian and thus his eternal wellbeing — to Paul. Hence, Philemon “more than owes” Paul his request to have Onesimus — who was once “useless” or “unprofitable” and “without Christ,” but is now “profitable” and “well-in-Christ” — as a fellow worker in the Gospel.